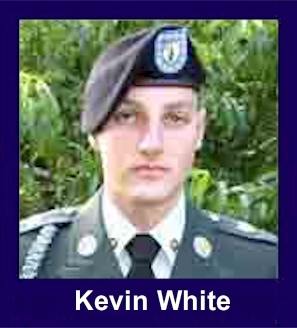 The 35th Infantry Regiment Association salutes our fallen brother, CPL Kevin W. White, who died in the service of his country on May 2nd, 2011 in Kunar Province, Afghanistan. The cause of death was listed as Improvised Explosive Device. At the time of his death Kevin was 22 years of age. He was from Westfield, New York. Kevin was posthumously promoted to sergeant E5. He had previously served one tour of duty in Iraq. Sgt. Kevin W. White, US Army, age 22, of Martin Wright Road, Westfield, NY died Monday, May 2, 2011, after being injured in action, while serving with the US Army at COP Honaker-Miracle, Afghanistan. Kevin was born on May 20, 1988 in Westfield, NY the son of Paul L. and Patricia J. (Baer) White of Westfield. A Westfield resident all his life, Kevin was a 2006 graduate of Westfield Academy and Central School. During his youth, Kevin was active in the School Rifle Club, Ski Club, played Soccer, Tennis and Volleyball. He was in several high school plays and sang in the chorus. He enjoyed Turkey hunting, archery, snorkeling, spear fishing and all things Hawaiian. He was an avid Air Soft player. He enjoyed the opportunity to travel and experience new things. Kevin enjoyed an adventure. He liked to work on his car. Kevin's family was the love of his life and his many friends were important to him. Upon graduation from Westfield Academy and Central School, Kevin enlisted in the US Army Infantry and proudly served his country in Germany, Iraq, Hawaii, and Afghanistan. Sgt. Kevin W. White joined the Army 25 July 2006. He did Basic Training at Ft. Benning, GA. His first duty station was at Smith Barracks Baumholder, Germany 1st Armored Division. After his tour of Iraq he was assigned to Schofield Barracks, HI Company D, 2nd Battalion, 35th Infantry, 3rd Brigade Combat Team. He served overseas duty in Germany from Nov. 2006 until Oct. 2009 and during that time he was deployed to Iraq from April 2008 until June 2009. Sgt White had served in Afghanistan since 7 April 2011. Air Assault training in 2010 and the Warrior Leader Course for Military Education in 2011 where he made Commandant's list. Sgt. White was Awarded The Bronze Star Medal, Posthumous, The Purple Heart, Posthumous, the Army Commendation Medal, Army Achievement Medal (twice), the Army Good Conduct Medal, the National Defense Service Medal, the Afghanistan Campaign Medal w/Bronze Service Star, the Iraq Campaign Medal w/Bronze Service Star, (twice), the Global War on Terrorism Service Medal, the Army Service Ribbon, the Overseas Service Ribbon,(twice), the NATO Medal, Posthumous, the Combat Infantryman Badge, the Air Assault Badge, the Combat and Special Skill Badge, Basic Marksmanship Qualifying Badge Bar, Weapon: Rifle-Expert. Sgt. Kevin W. White proudly served his country for 4 Years and 9 Months. Mr. White was a member of First Baptist Church of Westfield. He is survived by his parents, Paul L. and Patricia J. (Baer) White, his two brothers: David J. and Stephen J. White all of Westfield, NY, his Maternal Grandparents, James W. and Joan (Bamberg) Baer of Busti, NY, and his Paternal Grandmother, Mary Ann (White) Wheeler and her husband Woodrow of Mayville, NY. He was preceded in death by his paternal grandfather, Herbert White. Calling hours will be Thursday, May 12, 2011 from 2-5 and 7-9 PM at The First Baptist Church of Westfield, 9 Kent Street, Westfield, NY. The Funeral Service will be Friday morning at 11:00AM at The First Baptist Church of Westfield, with Rev. Thayne Bodenmiller officiating. Burial with full Military Honors will be private in Westfield Cemetery. Flowers are gratefully declined and Kevin's family wishes memorials be made to Northlake Family Recreation Center, PO BOX 334, Westfield, NY 14787. For those wishing to sign a community register book, you may do so at the Westfield Village Hall (Eason Hall) 23 Elm Street in Westfield starting Thursday morning. (Westfield, NY) -- The weather this May day took a dramatic turn for the better. It was as if the events of the past week in Westfield received a special stamp of approval from the highest authority. The sun was warm and bright and comforting as old friends and neighbors lined the streets to welcome home one of their own May 11. Thousands filled every foot of the E. Main Street sidewalks, offering a salute of American flags in welcome as Kevin White returned home. Every civic and military organization in town and many from the surrounding communities were present at nearly full strength despite the midweek event. Such was the community support of respect and pride demonstrated on this beautiful spring day. On Thursday, the community gathered again. And again the day was picture perfect; but this time it was to begin the sad process of saying goodbye to their old friend and neighbor. They came in numbers, and stood in long quiet lines to say their goodbyes and to offer their old friends, the Whites, words of condolence and support. That afternoon, I met with my old friend Mike Slyck, B Co. 2-35, at a hotel in the neighboring town of Dunkirk. We came to represent the Cacti in showing our pride and respect for this young warrior. Together, we drove the 12 miles from Dunkirk to Westfield. As usual we shared our old stories and exchanged nervous laughs as we prepared to make the visit and say the words and offer the condolences that all of us dread to have to make again. As we entered the town of Westfield, it was easy to see what had occurred here the day before. American Flags lined the nearly empty streets. Our turn onto Union Street and approach to the First Baptist Church on Kent Street completed the story and explained the empty streets. You see, the town of Westfield was here. In this one small block the citizens of Westfield could be found in long patient lines leading to the front steps of the church. American flags framed the front of the church and the lines leading to it. The Patriot Guard stood their duty stations, and held the flags high in salute to our young hero. Mike and I joined the townsfolk and slowly advanced toward the entrance as we learned during our time in line that the little girl over there in the yellow dress was the niece of the young lady in front of us and that the older couple 20-feet in back of us were neighbors of the couple 10-feet ahead and one of Kevin's old school teachers was just behind them. A dozen other little small town tidbits kept pace with us. During our slow advance to the door, several people noticed our Cacti regalia and asked about it. We explained our presence a few times before we reached the family, and were thanked for our presence and for our service just as many times. It took a while, but finally we worked our way to the front of the church where the family stood in a receiving line. By then they must have been on their feet for many hours, but as neighbor after neighbor passed through and friend after friend offered their sympathies, they stood there and received one and all: the two brothers, David and Stephen, and the parents Paul and Patricia. Mike and I offered our condolences to the brothers and along with our condolences we explained to Mr. and Mrs. White who we were and why we were there. Tears filled their eyes, as I'm sure they had been filling them all day, and they seemed so appreciative to have us there as we shook their hands and hugged Mrs. White. We then moved on to the closed flag draped casket and bedraggled group that we may be, we offered our finest military salute to our brother and said a prayer for him. At the foot of the casket stood at attention one of the sharpest soldiers you might ever hope to meet. The Cacti insignia on his shoulder told us what we needed to know. We stopped to thank our Cacti Brother SSG Contreras and to tell him how proud we were of him and all of our active Brothers. SSG Contreras had a duty to perform but came to at ease and we were able to shake his hand, and tried hard to convey the pride we felt in his presence, appearance, and attention to duty. And this certainly is hard duty. In a side room we found a second Cacti Brother, SFC Maciel. He and SSG Contreras were alternating in their honor guard duties and SFC Maciel was able to talk to us for a brief few minutes before he had to resume duty. Once again, we were filled with pride to see just what sort of a representative the Cacti was able to send for this sad duty. Rain was in the forecast for funeral day but Friday morning dawned sunny and clear. Up early, I drove back over to Westfield in hopes of learning more of the location of the cemetery. The cemetery services after the funeral were advertised to be "private," so I wanted to assure that I would have the cemetery information for our records without intruding on the family wishes. I chose this day to drive over using the State Rt 20 instead of Interstate 90. As I drove the 12-15 miles I passed through several small towns. In Lamberton, Brocton, and Portland, I found the streets lined with flags and the major flags of each small town were at half mast. It truly was a regional community event and extremely gratifying to see. I found the cemetery and identified the location of the grave site and then drove past the church and through the town. In the quiet of the early morning the street sweeper was busy making sure that everything was just perfect as other road crews and grounds crews groomed the common areas and sidewalks in preparation of the final goodbye. Mike and I arrived back at the church an hour before the services but it was immediately evident that we were too late to find a seat in the church sanctuary. Cars were parked everywhere in the residential neighborhood and the front of the church was awash in American flags, each held by a Patriot Guard member. There were dozens of them. Westfield Schools were closed for the day to allow teachers and staff to join the rest of the town in paying final respects to Kevin. We found a parking place a couple of blocks away and made our way back to the church. As expected, by now, we were directed away from the main entrance and into the church hall adjoining. Here they were simulcasting the services onto a large screen in the front. Just over 200 chairs were set up here and each was filled more than a half hour before the service was due to begin. Several hundred plus people sat in a warm room but it was quiet in there. About the only sounds was the swishing of a program as it was used to fan in defense of the warmth in the room. I talked to the funeral director as we entered the hall and asked what they were going to do when the room was filled, as it was certain to be. He told me that yet another church down the street was providing a hall and the service would also be simulcast to there. And so, the people of Westfield came, many hundreds at least, and in to the thousands in all probability to honor their hero. The funeral was very dignified and fitting for our hero. All the prayers were said and the minister told "the Story" -- the story of Kevin's life as well as "The Story" of all of us. MG Kendall Cox stepped to the front to talk of Kevin's military career and to pass on stories from Kevin's buddies in the field. Kevin's grandfather came to the podium to share some special stories of Kevin's childhood. It was especially poignant when, as a veteran, he stopped in front of the casket and offered his grandson a formal salute. There weren't many dry eyes in the room following this. Finally Kevin's parents were presented with a Gold Star banner and the benediction was offered to end the service. Hundreds poured out from the various viewing places to make their way to the front of the church as Kevin was carried out for his final ride. Mike and I joined the many veterans and active military in a final hand salute to our brother. The day ended here then for most of us as the private party accompanied Kevin to the cemetery. Mike and I returned to our hotel and said our goodbyes to begin our return trip to our homes. We had spent a very sad but satisfying two days in and around Westfield, New York and came away with an appreciation for the wonderful people we found there. Our Brother is in good hands and won't soon be forgotten on the home front. Of course, we, as an Association, have vowed never to forget Kevin and all of our Brothers who made the ultimate sacrifice. So our duty, in this regards, begins anew today.